We are a leading Manufacturer of rice bran solvent extraction plant from Thane, India. Kumar Metal is a well known name for providing Rice Bran Solvent Extraction Plant .Rice bran is by-product obtained during rice milling operation. This is golden reddish cuticle obtained after removal of the husk and during polishing of the rice. Rice Bran Solvent Extraction Plant contains 16 to 22% oil and this oil is recovered by solvent extraction process. Rice bran being floury material it is essential to palletize the bran before being put to solvent extraction process. 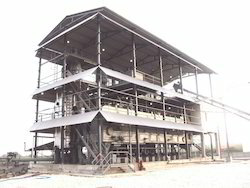 The solvent extraction of palletized rice bran is carried out in normal way. Looking for Rice Bran Solvent Extraction Plant ?